“This is a major milestone in delivering this project that the local communities requested,” said Chris Werner, acting executive Director of the North Carolina Turnpike Authority. A need for an east-west crossing of the Currituck Sound was first identified in 1975 and formal planning began in 1995 by the North Carolina Department of Transportation. The Turnpike Authority became involved in the project in 2006 when local leaders considered funding the project with toll revenue. 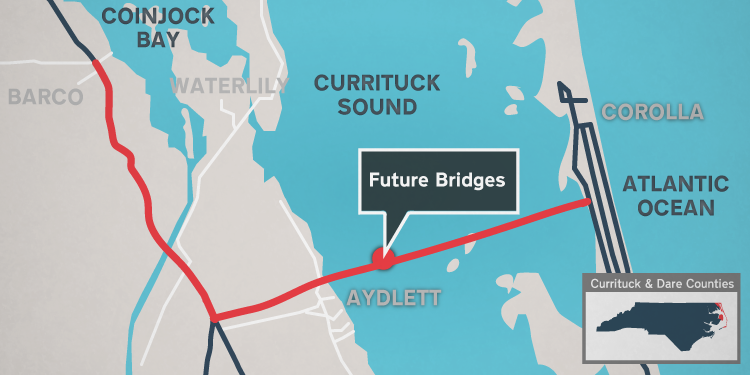 The Mid-Currituck Bridge is billed as an additional evacuation route to an area of the state frequented by hurricanes. Currently, hurricane evacuation clearance times fail to meet the state designated standards of 18 hours, according to the state. The 40-mile shortcut is expected to provide a travel time savings of about two hours one-way during peak travel periods. The project has an overall estimated cost of $440 million. Some of the funding is expected to come from bonds that will be paid back with toll revenue. The remainder is expected to come from a combination of state and federal transportation tax revenues.